The controlled burn, viewed from trhe hillside opposite where the fire was first lit. 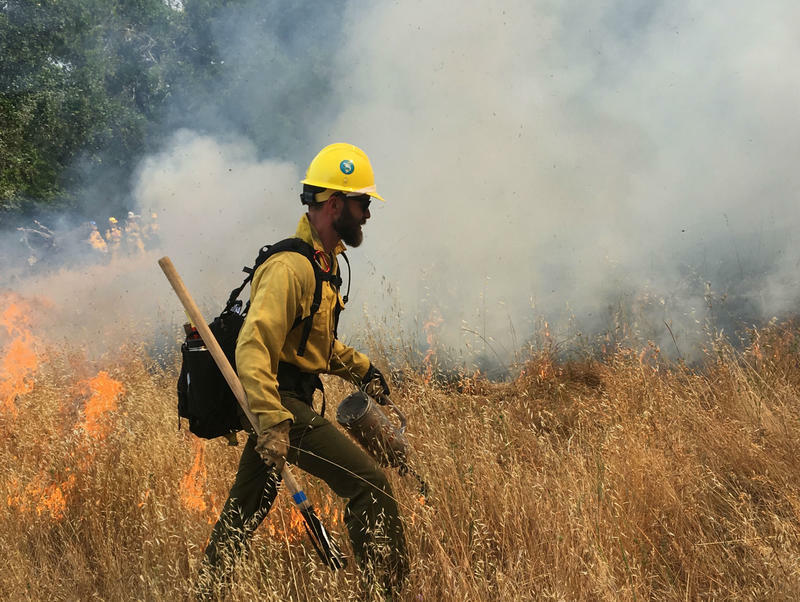 Paul Beisner, a specialist from the Golden Gate National Recreation Area's fire crew, led the way in getting the controlled burn started. A solar-powered remote weather station, recently installed by CalFire, helped monitor winds and other conditions before and during the controlled burn. 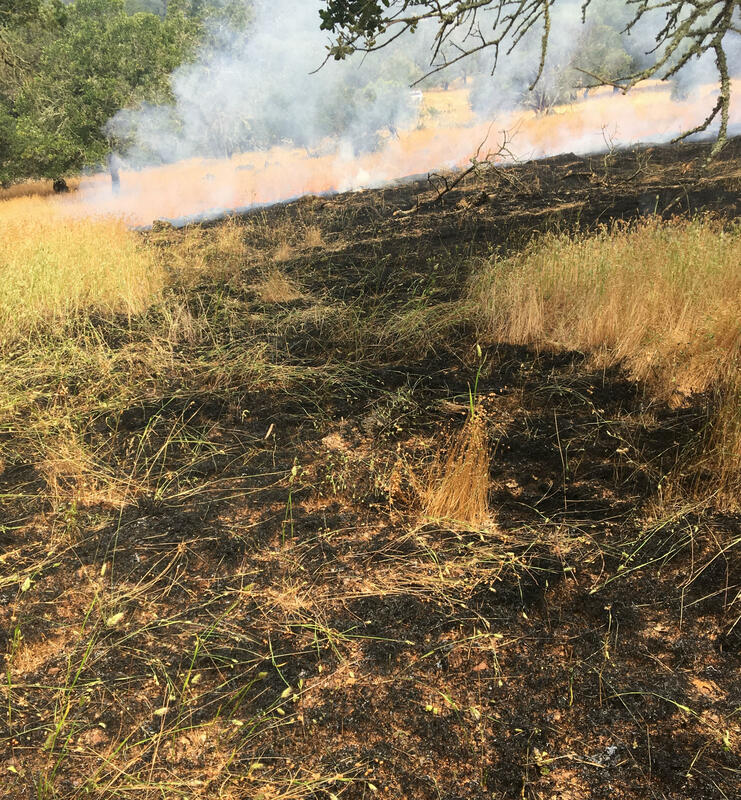 Dry grass burned readily, but spread gradually during the controlled burn at Bouverie Preserve Tuesday morning. 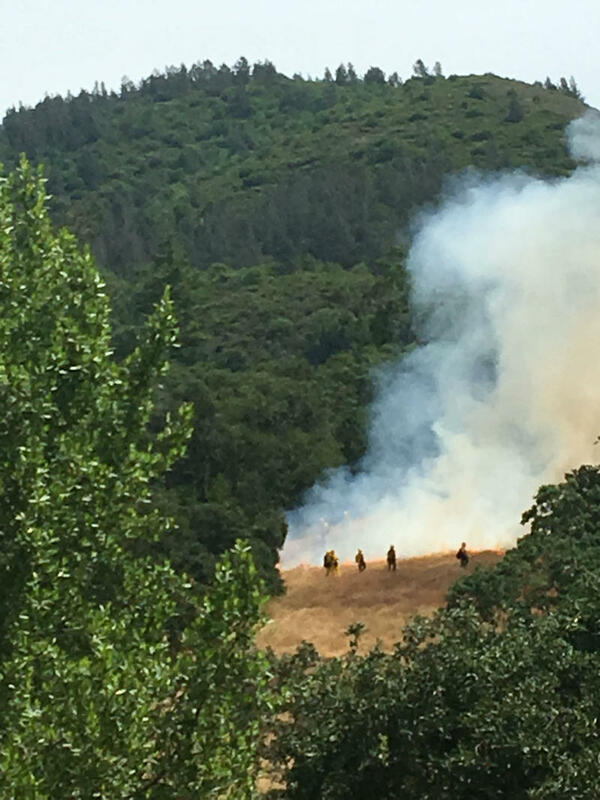 That plume of smoke rising from the Bouverie Preserve near Glen Ellen late Tuesday morning was a carefully watched experiment in applying a land management technique that goes back thousands of years. 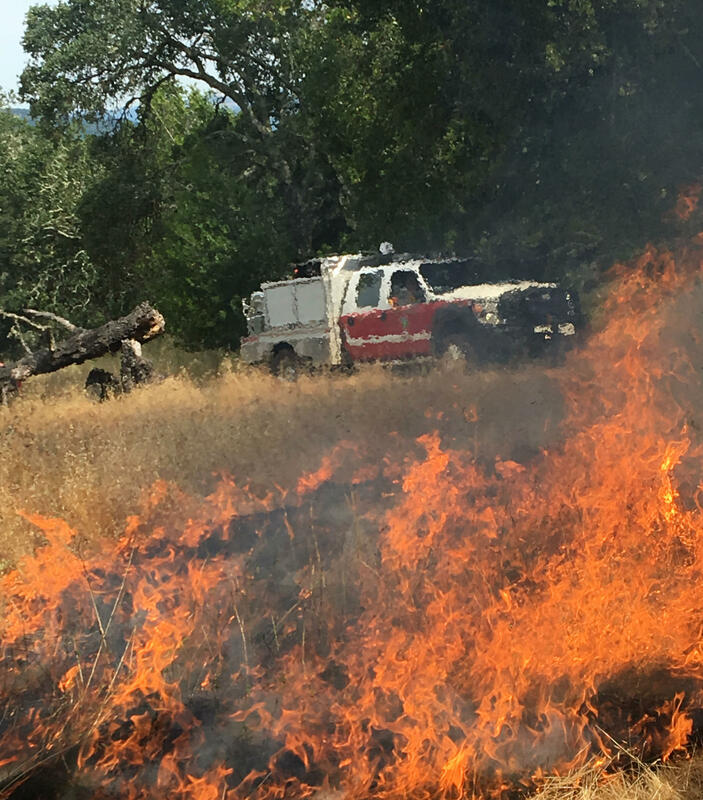 The fire took about three hours to burn across the designated 17 acre area. That was ample time for any affected wildlife to leave the area or take cover underground, says ACR Fire Ecologist Sasha Berleman, while deer, when they return, will find a more hospitable landscape. The low flames swept through areas with scattered green growth leaving that behind while devouring the dried grasses that predominated. The passing flames left the hillside mostly blackened, but studded with patches of green, that didn’t burn. 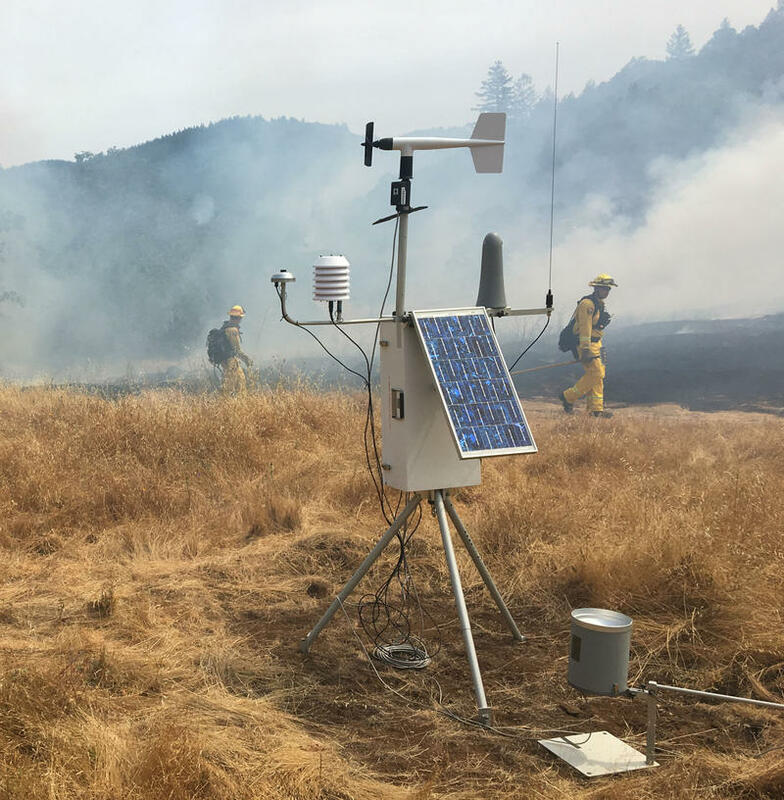 But the long-term results of the controlled burn will not become fully apparent for month to come, observes Jeannie Wirka, ACR’s Director of Stewardship. Urbanization, with its networks of highways and fences, means that controlled burns such as this one must now be confined to relatively small areas. But even within those lands, says Greg Sarris, chairman of the Federal Indians of the Graton Rancheria, the present-day ecosystem is very different from those managed by the native people of this area several hundred years ago.